Drive-in latches and radius corner face and strike plates may be substituted upon request. Backset - In the US there are two common backsets for residential locks, 2 3/8" and 2 3/4". The backset is the distance from the edge of the door to the center of the 2 1/8" bore hole. We will pack your locks with the backset you specify for each item you order. 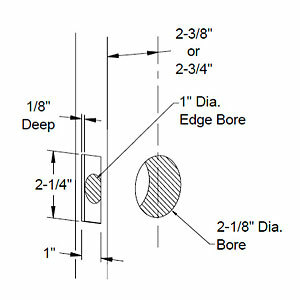 Bore a 1" hole in the edge of the door located on the centerline of the 2 1/8 bore. The latch will fit into the 1" hole. Chisel out a 1" X 2 1/4" rectangle on the edge of the door, 1/8" deep. The face plate of your latch will sit in this recession. Some sideplates require two sets of holes with a center to center measurement of 3 3/8, 3 5/8" or 5 1/2" center to center depending on the plate style. See each style for door prep and installation instructions. Tubular entry sets require a center to center measurement of 5 1/2". Dummy sets require no door prep. Dummy handles are surface mounted and may be located anywhere on the door you choose. They are usually located to match the appearance of nearby operating locks.